A sour frowning girl coming out of the night. while a vinegar scowl covered her face and her head. that matched the blue kerchief she used when she sneezed. and her vinegar snarls made the kittens stop purring. when her big poncho flapped and she started to shout. and began chopping peppers for a warm winter curry. “Take off your big poncho and relax for a bit. and I felt a bit frightened when she gave me that stare. But she pulled her sled over and marched down the hall. Then after four lightening quick minutes, she had eaten it all. 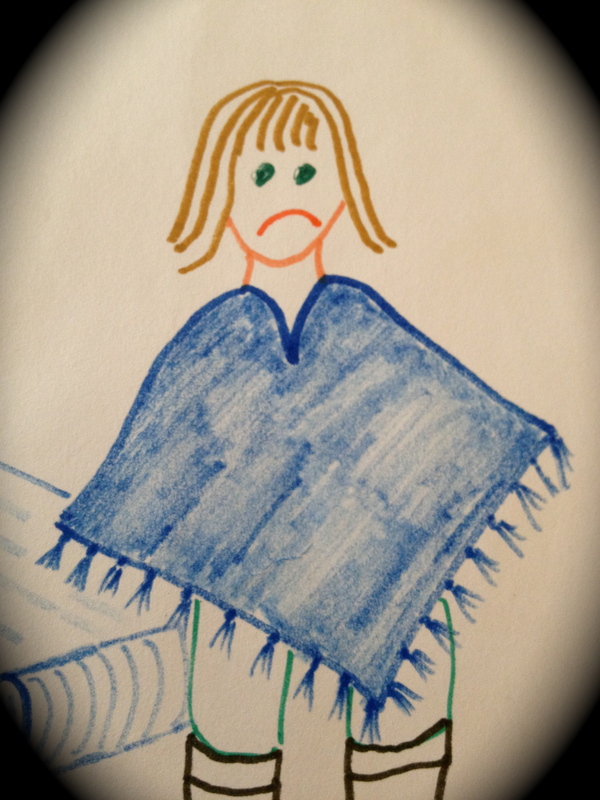 The growl was the tummy that her poncho did cover. and scowled ‘round my kitchen, fixin’ to leave. She said, “I’m a vinegar girl from a vinegar place. For years I’ve been wearing this vinegar face. But with a belly of curry, I’ll wear it no longer. The path from the belly to the heart is not very long. Heat the olive oil in a large soup pot over medium-high heat. Add the onion and saute until soft and translucent, about 5 minutes. Stir in the cabbage, turnips and carrot. Add the salt and saute until the cabbage is cooked down, about 10 minutes. Stir in the spices, tomatoes, green beans and chickpeas. Add the fennel. Lower the heat, cover and simmer for about 15 minutes. Stir in the lemon juice, and taste and adjust seasoning. It’s clean out the fridge Saturday and I was inspired by the Gourmet Veggie Mama, Lauren. After the chopping, this throws together fast and is a tasty treat for lunch or to have in the fridge for a meal later in the week. What meal will you be poetic about this week? It’s hard to be happy when we’re hungry. And the stew sounds yummy too! Clean out the fridge Saturdays (or Fridays) are the best! We made homemade egg rolls last night to use up some veggies that were beginning to outwear their welcome. I know, right? I have fun with it although other members of my house would prefer it all just went away. Thanks Nancy. This was fun to write. What a moving piece, is it yours? I agree and there is easily a solution. For each circle of 5 friends on FB, Panera will donate a bowl of soup to Feeding America®. Interesting Nancy. I’ll check it out. Hidden talents Tammy! I love it, thank you! WOW! Very powerful! Great post! Thanks nats1mom. Loved your Target rant too. It’s important that we use our voices to discuss these concerns. Wow, I love a poem to go with a recipe .. .and one about feeding the hungry is just so good! You can do anything, Tammy! Thank you! This poem has been rattling around in my head for months and months. It feels so good to put it on paper. I have to say I really enjoy the illustration! Thank you for that – and you are a real artist! Confirmed: You are my fav poet. And I totally dig the sketch. By the way do you know that I am much like your vinegar girl? I’m the worst when I am hungry. I get frigidity, I snap, I wear a scowl like your girl and I am tantrum personified. Once fed, this girl is your slave. I have a similar issue which may be one of the reasons that I enjoy food so much. Sally, Vickie and I just spent the afternoon in Portland. We went to Benessere, a boutique specializing in olive oil and …. vinegar. Vinegar is WONDERFUL! We went to one of those vinegar boutiques also. I brought home a chocolate balsamic that is really good. I need to remember to use it. Happy Birthday brother! Lovely poem and sketch of my daughter, who is just like that when she needs to be fed. Is she ever truly hungry? Nope, she has not experienced true hunger. But she’s still a vinegar girl and happy after eating. This stew sounds tasty, too–Lauren has great recipes! I agree and it’s such a good one that can be modified to the season. Smiling delighted at the Vinegar Girl! What a fun poem. And the stew looks marvelous. Making me hungry right now. It is one of those that improves on the second day. You’re quite welcome. Will you have shared meals in a cohousing arrangement Diane? I love your poem! Too funny that your poem is about vinegar, as I just made some wonderful baked beans made with vinegar and coffee. I wrote it and then read your blog and thought they went together so well. It’s true Debra. I believe that if we really got conscious about food waste and nutrition, then we could beat hunger back. And I also believe we could begin to do it with locally grown foods. The poem and the picture just wonderful and a strong reminder. Vinegar not always sour. It can be sweet and wonderful, like life lessons learned over time. Thanks for keeping us mindful of the need of others! Hunger is a hard lesson for anyone but it breaks my heart that there are children who experience it and even worse that we then feed them with cheap calories that affect their longterm health. I am forever amazed by the range of vinegar flavors. Rereading this wonderful poem takes me to a soup kitchen I volunteer at. And, curry so good for healing and keeping healthy! Your recipe has all the right ingredients! 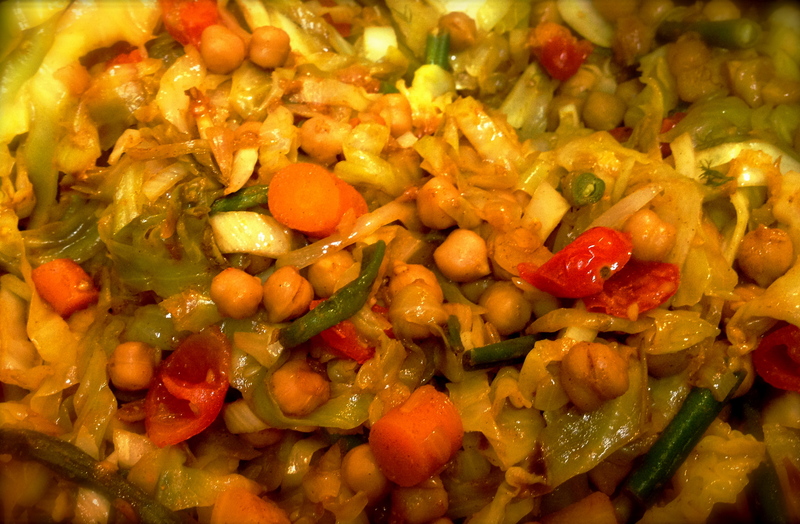 This curry is easy and fast and got very good reviews from 6 of 7 who were around the table. Wow, Tammy – what a beautiful and powerful poem! Thank you. I’ve been noodling it for years. I love the way you’ve honored the art of poetry all month long. It’s been fun and I’m a bit sad that it’s passed. I still had a couple more to share! Oh well, something in the coffers for next year. Your trip is wonderful! Fantastic, Tammy, I just love The Vinegar Girl. Lots to think about here! I’d love it if you told me what your children think of it. You are so creative. What a blast it was to read this. You give me giggles with your imagery! So cute. Plus great use of the word “vinegar”. That would make a great song, too! Thanks. I began this as a creative writing exercise with made-up words. Then I had to find a word that would fit the poem. Vinegar seemed the most appropriate. Thanks for the kind words. I’ll be over although I haven’t been good at awards. Hope you’re doing well. Don’t worry – it’s all in fun 🙂 Glad to see you are doing well! So easy and tasty and perfect for that new man of yours! Cute! When my kids were little, I used to say I was going to write a kids book called “The Little Girl Who Told Sad Stories.” In the end she’d get more cheerful by telling happier stories. I am thinking of making this into a book. Love it. More because it is followed by a yummy treat. Thanks. the treat is really yummy. Fab poem !!! More please ! Tammy, I love your poem: lovely it is! 🙂 I love the drawing too 🙂 This dish sings to me,…yummmm! and it is so yummy!